I love flowers, I always have. I took a horticulture course in college just so I could have a fresh flower arrangement in my apartment each week. I'm such a sucker for them. And even though I have my favorites, I find that I love so many -I love the varieties in their color, their texture, and their height. Just like floral arrangements, outside landscapes need balance, proportion, scale, and depth. Ever wonder why those Better Home and Gardens landscapes look so great? Like any good design, they have layers. Want to get started on creating your own Better Homes and Gardens garden? If you are starting from seeds or bulbs, always check the height. It is usually written in inches and pretty easy to find on the packaging. Consider how long a plant is expected to live and when it is expected to bloom. Annuals only live for that long, one year. Perennials continue to grow each year. 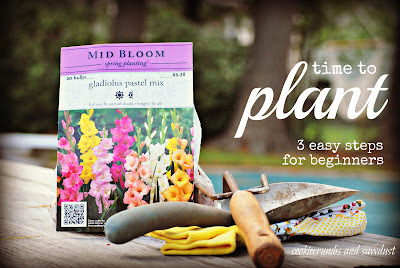 Plants will bloom early, mid, or late in the season. Check the packaging if you are unsure. Incorporating early, mid, and late blooms will provide constant color. Pay attention to your plant's light requirements and plant accordingly. Full sun plants really do like the sun. Check throughout the day to see how much light your location gets. Planting a full sun flower in the shade won't thrive. It can also be really fun to account for texture and fragrance. But I'll leave that to others with more experience. This year my goal is to plant a cut flower garden. The overall arrangement doesn't have to look perfect, since I will be sniping at it all season. Yesterday I was able to get outside and get a few bulbs in the ground. Remember the mantra here at the little yellow cape, baby step by baby step. If you are interested in learning more, I found these free printable No Fuss Garden Plans from Better Homes and Garden, complete with a plant list, a layout diagram, and lots of helpful information. With 19 to choose from, it was easy to select a plan that meet my specific needs. Great post! Yesterday I worked in the yard filling some outdoor pots with foliage and color...and my Iris garden is exploding with blooms that I cut in bunches and bring inside. Love this time of year! I can't wait to tackle our backyard. I would love to have a cutting garden!! not good luck with flower plants, but I can grow some tomato plants :) thanks for stopping by my blog! Great info! I need to begin planting, the weather is perfect right now. Your newest follower. These are great tips! I have to get my garden in!!! We just started an indoor herb garden about a month ago and it's doing great! I wish I had any sort of outdoor area though, I'd love to actually have a real garden :-) I'm your newest GFC follower now!